Lloyd Dunaway Obituary - Beattyville, Kentucky | Newnam Funeral Home, Inc.
Lloyd Barker Dunaway, son of the late Elijah and Rosa Williams Dunaway was born in Lee County, Kentucky on December 20, 1947 and departed this life at his home in Beattyville, Kentucky on April 12, 2019 at the age of 71 years, 3 months, and 23 days. 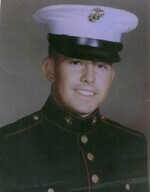 Lloyd was a Sergeant of the Unites States Marine Corps, a Veteran of the Vietnam War, and a Purple Heart recipient. He was also a retired Border Bender for Leggett & Platt. He is survived by four children, Tina (Mark) Stephens of Dexter, Maine, Ralph (Tammy) Clifton, Sonny (Kristy) Dunaway, and Melissa Olinger (Larry Reece) all of Beattyville, Kentucky; twelve grandchildren, Leandra Clifton, Tyler Clifton, Matt Olinger, Hunter Clifton, Lloyd Olinger, Nevin Olinger, Morgan Stephens, Abby Clifton, Lauren Dunaway, Logan Dunaway, Lacey Dunaway, and Cruze Simpson; two great grandchildren, Aleeah and Carolina Olinger; and a host of other relatives and friends.